What could be more welcoming when entering your home, than the sound of Venus, the goddess of the love? Made from lovely Alder wood, naturally treated with linseed oil. 21 x 11 x 7 cm. 370g. What could be more welcoming when entering your home, than the sound of Venus, the goddess of the love? 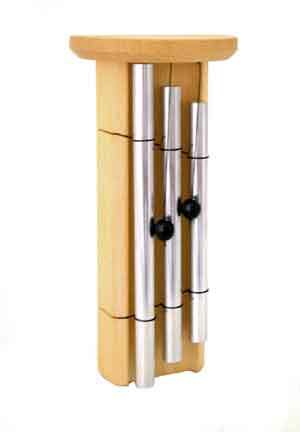 Solid chime rods produce a harmonious triad.With a small square roof, tuned to the oscillation of Venus. Attaches to any door. No screws required. No electricity. Two beads on the end of two cords swing to and fro with the movement of the door. The chimes can be silenced by hanging up the beads. Handmade by a musician in Germany. Made from lovely Alder wood, naturally treated with linseed oil. 21 x 11 x 7 cm 370g.